Hello there! How are you all? Well at long last, Goal Number 1 is completed! Hurrah, so excited to have it sewn up. There were times when I wanted to throw this all in the bin and be done with it, but I have to say, you do feel a rather satisfying sense of accomplishment in completing a fully lined jacket and seeing a project through the ups and downs of the challenge, through to completion. I am pleased with the results, it fits well, perhaps just a bit too well and I could have really just graded the pattern down a 1/2 size or maybe, really just through the bust section, as this was the most problematic in terms of fit. 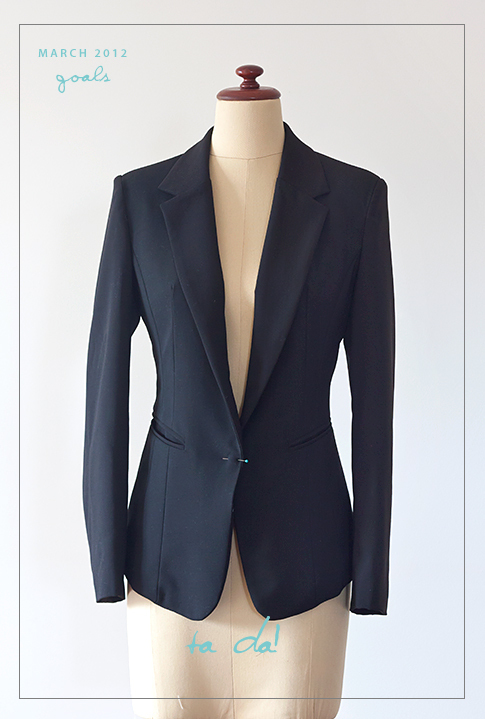 This Jacket wasn’t without its challenges, starting with the fit issues with the pattern, no seam and hem allowances included and no separate lining pattern either, which have all added a considerable amount of time to the project. –Drafted under and Upper collar. 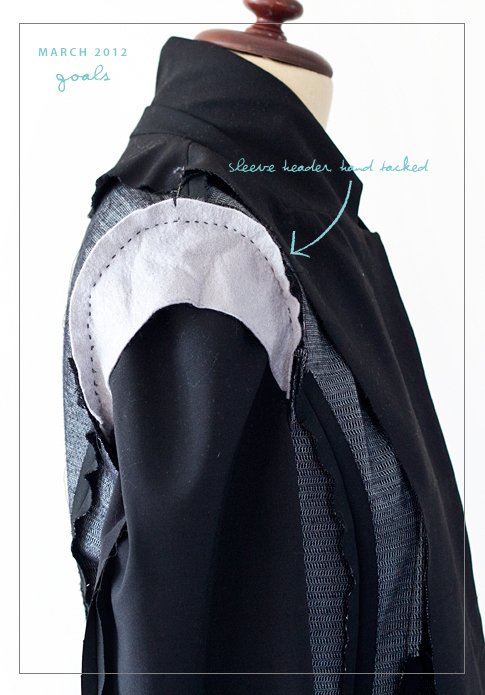 –Drafted separate lining pattern, with back pleat, ease added at the armhole and extra length. –Drafted Welt pocket and pocket bag pattern pieces. –Shell: I choose a high quality light weight wool suiting with 10% spandex, it has a lovely drape and handle and was a beautiful to sew and press. And if you are local in brisbane or the Gold Coast, Qld, The Fabric Store in Brisbane, has great selection of wool suitings (amongst other beautiful fabrics). There are few things I did in constructing this jacket that I have photographed and shown below. 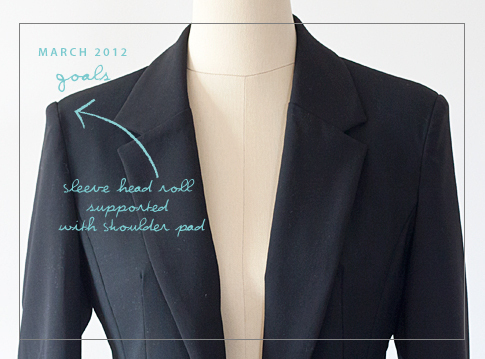 In reading through ‘Couture Sewing Techniques’, by Claire Shaeffer, She recommends catch stitching pre shrunk cotton tape along the role line and along the lapel and front edge of the jacket, (edge of the tape to lie flat against the seam line). I loyally followed all of Shaeffer’s tailoring advice but perhaps my fabric choice was a bit too light, or perhaps the inclusion of spandex in my fabric proved problematic or perhaps I was just a bit heavy handed with the steam, but I found that the my lovely lapels just didn’t sit that well and were a little puckered and just looked well, hand sewn. Even the role line wasn’t sitting as nicely as I imagined. So I unpicked all my beautiful handwork, discarding the cotton tape, re pressed my labels and jacket front pieces and when all sewn back together again they sat a lot nicer. No puckering to be seen. I’m sure that this technique would produce a beautiful result on perhaps a more looser and heavier weight weave, but perhaps this fabric just didn’t need the extra support. I opted to block fuse all of the front and back jacket pieces with a high quality weft fusible. For those of you who are unfamiliar with the term Block Fusing, this is a method of fusing an entire piece of fabric before cutting out any pattern pieces rather than cutting out the pattern piece in the shell, repeating in the fusing and then fuse the two together. The advantages of block fusing is that you are only cutting the pattern piece once, saving you time, and in case of shrinkage, the fabric will shrink under the heat before any cutting out is to be done, giving you very accurate results. The sleeves I left unfused, applying fusing to the hem area, and over the fold line to give stability to a high wear area. To create that beautiful roll of the sleeve head seen on high end tailored jackets, I used a felting piece cut from the sleeve pattern, that I hand tacked on the sleeve just 3mm above the seam line ( of the sleeve) and the seam allowances then get turned into the sleeve which pushes the felt header to pad out the sleeve head. 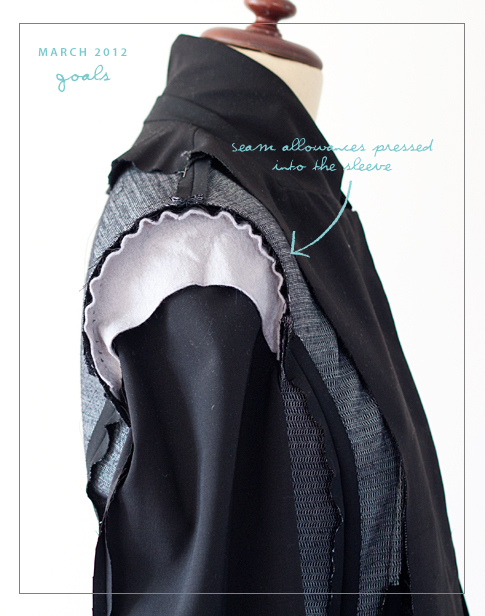 The Sleeve head is then supported by the shoulder pad. 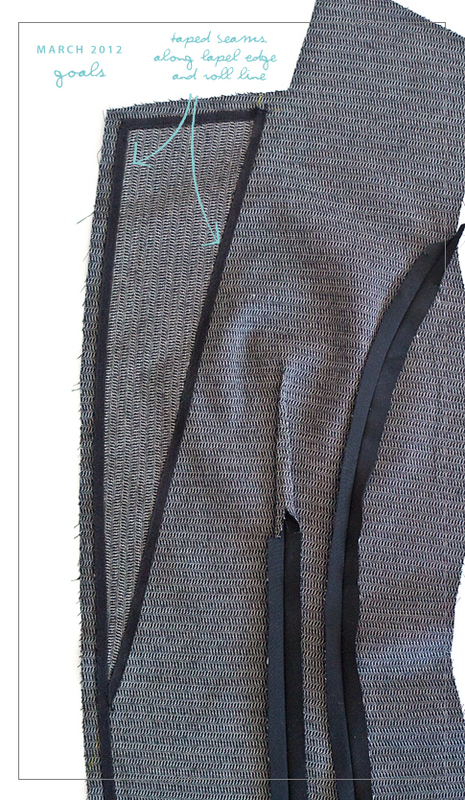 Shaeffers technique was to use a wool batting/felting cut into a long rectangle about 12cm long, by 6cm, fold in half and stitch it to the sleeve same as above. I did try this method also to see which would give the best results and once again perhaps this does depend on your fabric weight as I found it did give a nice roll on the sleeve head, but as there was an excess of fabric in the sleeve, there were visible bumps and bunching and didn’t give a smooth support to the sleeve. I cut a separate under collar on the bias grain with a centre seam that I steamed into shape over a pressing ham, I really do recommend doing this as it creates the perfect shape for your collar. For the upper collar pattern I added on an extra 2.5mm to the edges to help the collar edge to roll over the under collar and prevent the under collar from showing. for heavier weight fabrics you may want to increase that. I also added extra 2.5mm to the Front Facing edges also (just to the break point) , to assist in no seams showing from the front. –Measuring: Measure the Pattern prior, or if possible obtain the finished pattern measurements so that you know how the garment will fit you. Take into consideration; choice of fabric weight, plus linings and interlinings will bulk out the garment so you will need more ease than say dresses or blouses. –Toile: Do sew up a toile, and mark pocket placements, buttons etc on your toile and check fit and placement before sewing in your beautiful Fabric. 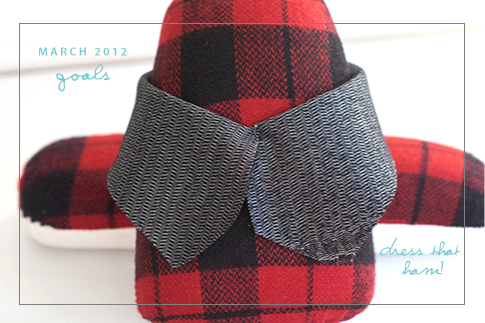 –UnderCollar; If your pattern doesn’t include separate under collar, draft your own with a centre seam, cut on the bias and reduce along the edges by 2.5mm (depending on fabric weight). So, it seams that my goal setting needs a slight adjustment in the timing department. But I have loved having some extra goals to work towards, so onwards towards Goal No. 2 and lets try for completion in Early May shall we?